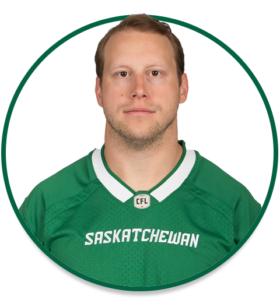 PRO: Signed with the Riders as a free agent in February, 2018…signed with the Winnipeg Blue Bombers in February, 2015…selected by the Saskatchewan Roughriders in the 2nd round (12th overall) of the 2012 CFL Draft. 2018: Started 18 regular-season games and the Western Semi-Final at middle linebacker…registered 41 defensive tackles, six special-teams tackles and two tackles for loss…added three defensive tackles and one special-teams tackle in the playoffs. COLLEGE: Played three seasons for the University of Calgary (2009-11)…finished his senior season with a total of 97 tackles and 4.5 quarterback sacks…named Canada West Defensive Player of the Year and First Team All-Canadian…named University of Calgary male athlete of the year…totaled 42 tackles and 3.5 sacks in 2010…named Canada West Defensive Player of Year.